- Used in secondary stage of suspension in high adhesion bogies. - Can withstand static and dynamic loading in compressive (max. 18.0 T) and shear (max 2.5 T) modes during operation. - Maintenance free with longer service life. Driven by technically advanced facilities at our ultra-modern infrastructure, we are presenting an extensive array of Rail Engine Metal Bonded Side Bearer Pads. PRAG manufactures cast donut design polyurethane side bearer pads for use in high-speed freight wagons in technical collaboration with m/s chemtura, usa. - No bonding, unique design with out bonding, only polyurethane based rings in between metal plates hence no chance of bond failure resulting very high service life. 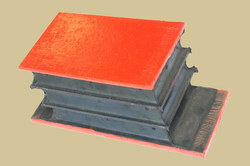 We offer Side Bearer as per the clients requirements and with high product quality and matching international standards. Made from high quality metal alloy these items are flexible, durable and great performing.